Mounts are faithful creatures, which allow us to travel faster throughout the countless worlds of the Spiral! They never slow down, ensuring that we get to our destination on time... And now it's your turn to give back! Take your favorite mount and imagine what its homeworld would be like. Is it a snowy land, or more of a sandy terrain? An enchanted forest, perhaps? I want you to create a home for your favorite mount. Since I have 8 codes to give away, I will divide this contest into two categories. The first one will be a Dorm Room decorating contest, and the second an art contest. Be creative! 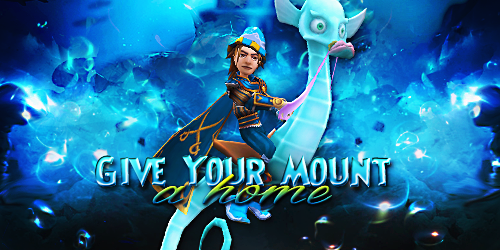 All entries must be sent by email to [email protected], with the title "Give Your Mount a Home Contest", along with your Wizard's name (such as David SilverHunter) by the deadline. If you have a question about any of the rules listed above, feel free to leave a comment below and I'll reply as soon as possible! Following the rules posted above, you will come up with a home for your favorite mount and make your creation come to life either in-game, by decorating your Dorm Room, or in a drawing/graphics composition! Entries must be submitted via email, as explained above. If you are under the age of 13, please have your parent's or guardian's permission to enter. My 4 favorite entries for each category (decorating & art) will win a permanent Spritely Seahorse mount (8 winners), which is currently retired, and all winners will also get a Teleport Tapestry to Vestrilund! Good luck, everyone, and have fun! Thanks a lot to Professor Greyrose and KingsIsle for providing the codes!